Early last November Typhoon Haiyan/Yolanda slammed into the Philippines, leaving more than 6,000 people dead, tens of thousands injured, and many more bereft of their homes and livelihoods. The storm was called the most powerful tropical cyclone ever to make landfall. Few of the international media who flew in to report on the devastation noted an underlying cause: subsurface ocean waters recorded at 9 degrees Fahrenheit above average, fueling the intensity of the storm. But National Nurses United, which rapidly dispatched a number of nurse volunteers, who provided basic, hands-on medical support for thousands of the injured, never lost sight of a broader concern. Taking a break one day from the medical mission, RN volunteers joined a press conference with local healthcare and environmental activists, noting that huge storms are not new but are far worse because of the consequences of the human-made climate crisis. "Climate change and global warming has brought this misfortune to the Philippines. This affects us globally, from Hurricanes Katrina and Sandy in the United States to typhoon Yolanda in the Philippines," said RN volunteer Jane Sandoval at the press conference. Given those experiences and what nurses see at home, NNU members join the climate march in New York Sept. 21 because they see the effects of the climate crisis and experience it in their communities and, most importantly, with their patients. For registered nurses the climate crisis is a clear and present public-health emergency as well as a creeping bomb for our planet -- and they draw a direct link between extreme forms of energy extraction and the horrific impacts they see on human health. 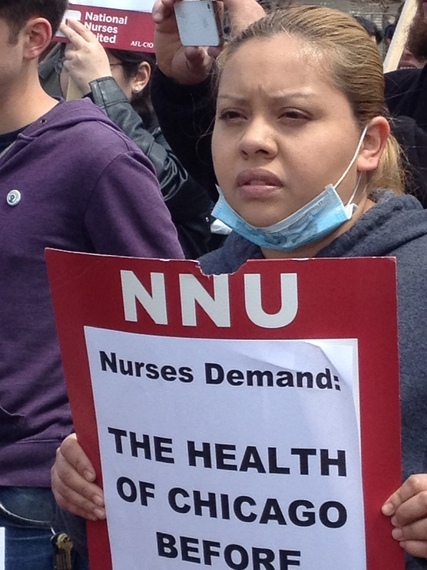 NNU members, for example, have been on the front lines, speaking out and protesting against the proposed Keystone XL pipeline, working to stop the expansion of polluting refineries in Los Angeles and Richmond, California, and standing with community members to rid Southside Chicago of petcoke piles. Opposing Keystone, NNU members have joined multiple public protests and sponsored a march across the Golden Gate Bridge and a national press conference with Sen. Barbara Boxer in Washington to highlight the harmful effects of the extraction, transport and refining of crude tar-sands oil. At the press conference in March, Brenda Prewitt, an RN in Houston, cited existing serious problems with pollution in that city and noted that the last thing area residents need is the arrival of dangerous tar-sands oil, which has been linked to reduced lung function, aggravation of cardiac systems and other ills, she said. 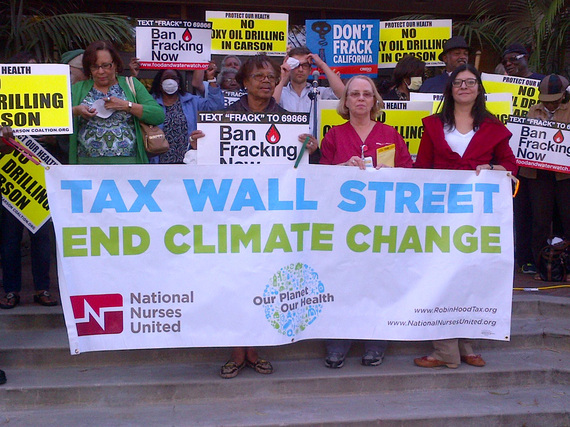 Standing near the latest in a series of oil spills in Los Angeles weeks later, RN Sandy Mulcahey said, "Our patients don't have to just be in a hospital. They're here in the community. It's our duty to take preventive measures to make sure our environment is safe." Children and infants are at greater risk due to their still-developing lungs and respiratory systems. The elderly and people with preexisting respiratory and cardiovascular diseases, diabetes, and cancer all face greater risks than the general public. Low-income and working families, because they are more likely to live near heavily traveled roadways and industrial districts, also suffer more. When coupled with the fact that these families also are less likely to have adequate healthcare coverage, this creates a real crisis in our community. The first thing they taught us as nurse practitioners is that we are advocates. We've been seeing a rise in respiratory illnesses -- so many colds, sinus problems, bronchitis, COPD, pneumonias. People will say it's the weather or something is just going around. But babies aren't supposed to have asthma. There's a reason for all this. 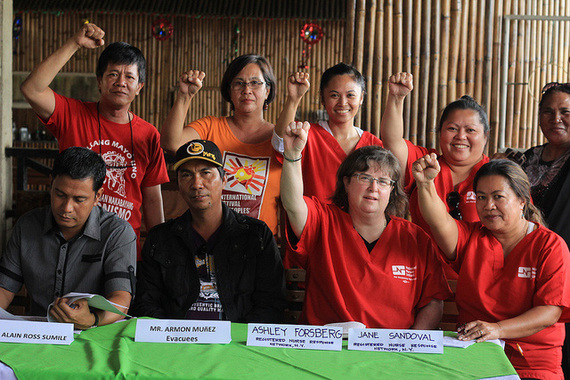 Turning to embattled residents still suffering from the effects of Haiyan and an oil spill that it aggravated last winter, RN Ashley Forsberg concluded, "We want you to know that we and our union are so proud to stand with you today in solidarity to advocate for the political and social changes necessary to fight against that threat together."